This photograph is from the files of the old Herald Newspaper. 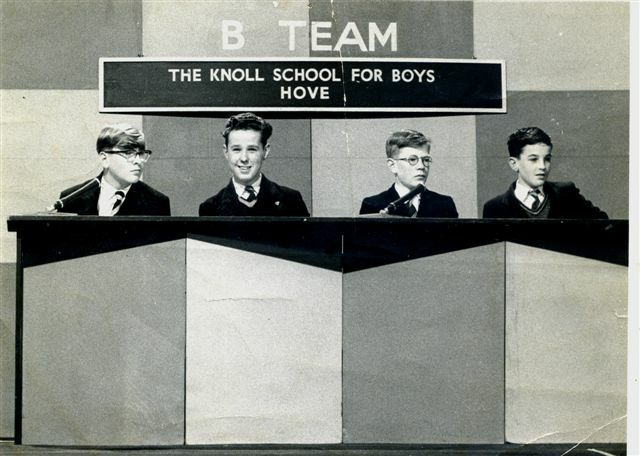 It shows the team from the Knoll School for Boys Hove, taking part in the Southern Television Quiz show Full Marks in I should think 1958/9. The show was recorded in the old late and much lamented red gothic Hove Town Hall. Kenneth Horne was the avuncular quiz master. The Knoll Boys lost to Mile Oak Girl’s school. I can identify two members of the team. The youngest is myself, Ian Beck, at the other end the eldest is Barry Tutte one of the school’s rare ‘aesthetes’, as for the boy in glasses I sadly have forgotten his name, although his father taught at the school I think. The boy with the wild fifties style hair I am afraid I cannot recall his name either (it was along time ago) I wonder if anyone else remembers the occasion, or has a similar picture of the girl’s team? The prize for being the sad losers was a book token for one guinea which I spent commendably on The Compleet Molesworth (sic) by Geoffrey Willans and Ronald Searle and I still have it. Hello Ian, You don’t say which end you were at, but I wonder what the first prize was for the girls. It may be that YOU were really the winner. Why? Well, first edition Ronald Searle’s, in good nick, go for quite a high price these days, and you might have made some profit. Full Marks! Hello Ian, I wonder if that is the same Barry Tutte than I met at Dartington College of Arts in the 1960s. He was studying music; he was a really lovely person. Sadly he died young. Do you know more about him? I think the one with glasses could be Hugh Lawrence and the other Michael Hall. Thank you for the comment about Barry Tutte. He was that rare thing for the time, a very intellectual and aesthetic boy in a pretty rough Secondary Modern School. Others of us of a similar mind (very few) would gather in the art room and pretentiously discuss all sorts of avant garde matters, the problem of Picasso and Stravinsky versus Shoenberg and the like. He very much took me under his wing and was kind and protective as well as encouraging. I am sure that he could easily have ended up at Dartington. I know no more than that about him and I am naturally very sorry that he died young. I would like to know more myself. I played in the School Recorder group with Barry Tutte, he was head and shoulders above the rest of us as players. The group was lead by Basil Waymark, a Knoll teacher who was the organist at the Dome at the time. I recognise the two in the middle, but don’t recall their names. Barry Tutt was fostered with a family in Haliburton Rd in Hove by a family with the name of Scrace. That is why he had to attend The Knoll School. I sang in the choir at Bishop Hannington Church with Barry and he received a medallion for a fantastic solo performance in Chichester Cathedral. Hi Ian, this photo was taken a couple of years before I moved up to the Knoll School from Juniors but I think I may be able to identify the third boy from left with glasses. Is he the one whose father taught at the school? I think he is Kevin Dowell, son of Mr R. Dowell who was my first form master at the Knoll and who taught English. I started at the Knoll in 1961, at that time Kevin Dowell was about third or fourth year. Mike, You are right. I believe they lived on Shoreham Beach at the time. I was in the same class with Ian and I also remember Barry who was a very gifted musician. I have fond memories of Barry and another prefect whose name escapes me performing ‘A policeman’s lot’ from the Pirates of Penzance at a yearly school concert. Hugh Lawrence’s father used to teach my brother who went to Hove Grammar School. Does anyone know where I can get back copies of Knoll School for Boys school magazines for the above period? Barry Tutte was, I think, the first person to go on to college from the Knoll; defo to Dartington for music. A couple went to teacher training from my year; G Howell and Robin Lacey I think. I went to drama college only because Headmaster Turner followed up after throwing me out for being pushy during the school plays and made sure I applied to audition at various drama schools. Ian Beck and Geoff Allison (Allinson?) in the year above me and Mick Embden in the year below were my mentors in the area of art appreciation and great new music. Embden played the first Rolling Stones album on reel to reel tape for me. Started the slow process of bringing me into the 20th C. Previously I would only listen to composers who were dead in case they changed and moved into areas I might not like. There was a young Scottish master who started an after-school club to listen to jazz and modern composers. He introduced me to Miles Davis etc. Any-one remember his name? I have some School Mags from 59 -65. If I can find them I might try to reproduce them. My main buddies were Doug Brown (dead at 21), Derek Bliss and Mick Helias, later Dennis Knight was a good friend and shared a love of American import singles and early Bob Dylan. Best Wishes from N California (marinmax@ usa.net). Howard touched on art and the arts. I think it was in the third and fourth forms we were taken for art classes by a very interesting and quiet (Eastern European I’m guessing) Mr Preim [sp]. Although very unimposing, I learned a lot about drawing and pottery from him. I learned the rudiments of music from one of the masters I respected most, Basil Waymark F.R.C.O., and I went on to play in various local bands as a bass player lining up with another Knoll boy – Richard Gadd. Interesting to return and find some new comments from some long lost old friends. James is quite right, Victor Prejm (I think that was how it was spelt) was the Art teacher and, as I remember it, a refugee from the Hungarian uprising of 1956, which would make sense. He was I think a sculptor and an enlightened and encouraging figure unlike so many there. Good to hear from Howard too who emphasises the importance of Drama which was introduced to the school by the sainted Mr Turner without whom I would have had no career. I knew Barry Tutte very well. We were in the same form and school recorder group. Basil Waymark entered us in many local music festivals. I also knew Barry after he left school as we continued to play recorders together. We both attended piano lessons with Doris Waymark, Basil Waymark’s wife. Barry left his foster home and rented a bedsit before attending Dartington College. I went on to Portsmouth’s Teacher Training College and we lost touch. I am sad to hear that he died young. The following message (subject: Barrie Tutte) was posted by Peter Rothwell. Barrie and I were close friends at Dartington and we remained in touch, Barrie often coming to stay with us. The children were very fond of him, until his untimely death. He had apparently named me as next of kin and as he died in Saudi Arabia where he was teaching, it was my number the Foreign Office rang to inform me. I arranged to have him flown home and cremated – his ashes were strewn by the River Dart in the grounds of his beloved Dartington. A few close friends and tutors had a picnic by the river and laughed about all the wonderful times we had shared with him. His oboe and recorder tutor had written a piece especially for the occasion and I read some of Barrie’s verse. I like to think that it was just the kind of send-off he would have arranged for himself. He is commemorated at Dartington by a plaque and a tree. JBTW as far as I can tell, in reference to the photograph of the panel, Barrie is the one on the left as we look at the screen. It was sheer coincidence that I found your site and I was very pleased to learn a little bit more about his esarly life about which he rarely spoke. He was a truly remarkable and gifted person and is still sorely missed. I have stunbled across these writings and I think I can add a little. I recognise the second person from the left whose name (I think) was Michael Hall who used to live in Bellingham Crescent. I was interested in Christopher Cole’s comments. Along with Barry Tutt, Jeffrey Kemp and Christopher Cole I used to be part of Basil Waymark’s Recorder Group in the late 50s / early 60s at the Knoll. I also had piano lessons with Mrs (Doris) Waymark. I went off to train as a Radiographer at Guy’s Hospital in London in 1962, qualifying in 1965. I worked at both Brighton General and the Royal Sussex hospitals before returning to Guy’s having passed my Fellowship of the College of Radiographers and then after marrying, moved to Margate where I became the Clinical Manager for Radiology until I retired (early) in 2000. I went off and trained as an English teacher and now work ‘as and when’ teaching English to foreign doctors, managers, lawyers (I have been a Magistrate for over 30 years) and even one Japanese orchestral conductor. The reference to Barry Tutt singing at the annual school concert ‘A ploiceman’s lot is not a happy one’ and the ‘Gendarmes’ with another – ’twas me! We all went our different ways but I did continue with some piano lessons in the early 70’s with Doris Waymark, and also came across Jeff Kemp at that time. I still give recorder recitals and in 1990 I gave a recital in All Saint’s Church Hove with an organist friend of mine to which Doris managed to attend with her carer. I remember the Knoll with affection although in the early years it was very spartan under Headmaster Sparkes and Edward Dellar. Dellar turned the school round and after his unfortunate ‘demise’ (I think in the year 1960 whilst I was ‘Head Boy’) James Turner took over. I was always fascinated with the organ and Basil Waymark fired that interest, so much so I have just finished 17 years as Choirmaster and occasional organist at St John’s Parish Church Margate. Hubert Osgood is a name I also remember well. He went off to train as a Dentist in the middle 1960s and was part of Basil Waymark’s musical ‘scene’ in the 1960s. It was sad to hear of Barry Tutt’s early death. Now that Dennis has identified himself as the other part of G&S duo, I do now remember him as head boy, and a very fair one at that, unlike some of the senior prefects who delighted in exhorting their meagre powers to the limit. Those pesky Robinsons were often confused with each other! I remember Alan Jones very well, along with Doug, Bliss, Mike Helias. When I return to this website I always read all the lastest comments sent in by others and to my surprise a name stood out that took me back to my school days at Knoll School for boys. The name was Dennis Talbot, the boy who played the recorder at the morning assembly before we started classes. If you are the person I remember, you lived on Stapley Road and I worked at Metal Box Company with your father in the MaintenanceDepartment. My email address is mpusey@sympatico.ca – I live in Niagara Falls, Ontario, Canada. Mr ‘Humbree’ Smith – who was always clearing his throat. ‘Chilly Chappe’ – who edited the swear words, Mr Martin – Tech Drawing, ‘Underpants? ?’ Liddell. (Who, by the way, was a Maths teacher when he transferred to Hove Grammar). Baz Waymark – is that note higher or lower? Daddy, Gooders, Lumsden – Woodwork, who introduced me to rock climbing, Griffin with the marcel wave, and many more… The Robinsons – Steve, Tony, Chris were famous for a day when their sweetshop was held up one night by an armed robber. Foiled by quick thinking Mum. On another occasion – popular when the ice-cream freezer went on the blink and the stock had to be eaten before it went off. I transferred to Hove Grammar 6th form, on my first roll call I gave my name to be greeted with a comment from the fully gowned master ‘oh yes you are from the Secondary Modern’. He didn’t quite spit but it clearly left a nasty taste in his mouth to use the words ‘Secondary Modern’. Voted Socialist ever since! It is interesting seeing where we have ended up after all these years. I live in a small village called Tide Head near Campbellton in the Province of New Brunswick, Canada. I was 19 years in the Merchant Navy. Seven years as Captain then joined the Railroad and retired at 55 years of age. Spend my time fishing, 4 wheeling and skidooing with a bit of hunting thrown in. Very different from Godwin Rd on the Knoll Estate where I grew up!! I attended the knoll from 1955 to 1961,and attended the quiz when the infamous last question to the girls was: what is the colour of a fire engine? the most stupid question of the night. I also seem to recall it was a tiebreak question. There was a groan of disbelief all around the hall, and we were told in no uncertain terms to be quiet. What a stitch-up. Richard, I think I remember you. Did you live in Bellingham Crescent and have two brothers Ronnie and Billy? Hi, Ian Richard Elms here. Sorry it’s been 50 years. I remember you and your brother and mum. Nice to hear from you after all those years- your call. Hi Ian. You will have to excuse my typing. Also I’m pretty new to computers. I’ll get back to you soon. Ian I think maybe you had a brother. I also remember your lovely mum and the comments you made upon her- cheeky chap that you were.What number Godwin was it? I, we lived at 43 Bellingham Crescent. Gordon, J,ean Billy, Les, I was walking your old road today- still the same Ian. Have you any family in England? I’m driving taxis at the present and are often up at Gatwick. Maybe I’ll pick you up. Keep in touch, God Bless. Look forward to hearing from you Richard. I was around the school from 58 to 61. I don’t remember the TV quiz show, although my memory not at its best. I do remember some of the staff:- Dellar (Teacher, leave those kids alone), Martin, Lumsden, Wymark, Liddell. I used to hang around with Robin Geiger, Fred Appleyard (who sadly passed away in 1988) and John Umney. The head kid in my class was Ron Davies who went into boxing. My parents had a newsagent shop at the bottom of Boundary Road. I used to walk to school with my two friends Pat Little and Margaret Maclennan. I am a USA citizen now working for Boeing Everett. Ronny Davis lived just up the road from me in Martin Road. I had a terrible crush for his fabulous looking sister Maureen who once showed a little bit of interest, but blew me out when I told her I was only twelve. Mike, you will probably remember Luffs the bakery just up from your parents’ shop? My mother used to to do a few mornings serving in the shop, and I have very fond memories of the 1d rolls covered in sesame seeds. Margaret Maclennan rings a bell, but I can’t put a face to the name. My cousin used to live in the next road to you, St. Leonards Road, where I used to spend a lot of time. My cousin’s neighbour, David Guppy, was also at the Knoll school, and I often had tea at his house (I still have a penchant for cheese and Marmite sandwiches). David was a very likeable lad although he was useless at sport. I would imagine all of the other classes surrounding the quadrangle/playground will remember Jack Liddell taking PE in that playground bellowing “Come on Guppy, run boy”; even Barry Gooders would join us in a good laugh at that weekly ear bashing. Mike – I do recall your parents’ newsagent shop in Boundry Road, also those names you spoke about: Fred Appleyard, Robin Geiger and John Umney. I think John Umney lived along the seafront somewhere and was a good swimmer. I am sure I was in your class at school. I now live in Australia and am retired. I did remember you Malcolm, but for the life of me I could not remember your christian name. You useD to live on the upper Old Shoreham Road. I do remember both of us having a crush on Haley Miles in the parent trip. Glad to see you have been able to actually retire. I have have a couple of bad marriages that took a toll on my retirement status. Although very happily married now – the US economy has taken a nose dive on us all. Thanks for replying; keep in touch, do you keep in touch with anyone else? Mike, thanks for the reply, I only had one bad marriage, which is average for our genaration but have been happily married now for 19 years. Went to Australia in 1964 and had a long career in Sydney transport department, and retired at 58 (luckly the Australian economy did not take a nose dive as it did in the UK and US). I moved To Tathra, New South Wales south coast. (Look it up on Google maps). Do you know what happened to Robin Geiger and John Umney? Well I don’t know if anybody remembers me but also went the Knoll in the late 60s and I had Mr Harman as my form master. The only names I can think off right now are Mr Smith – metal work, Mr Davies – RI, Mr Cook – art and Baz Waymark. He taught my dad Ted Jempson, my brother K.en and me I came top in music four years in row! I’m 55 now and live just at the back of the old Knoll school on the Knoll Estate and Ken lives on the Hangleton Road. Both mum and dad have gone now but it is nice to finally find a site for the old Knoll school. I think the headmaster was Mr Turner? I’m on facebook if anybody wants to get in touch. Doris Waymark died about seven years ago. I also had to fight off the Jack Russel on a Saturday morning. I left the Knoll in 1968 after six very happy years. If you go to this site you can see the Knoll and Daddy Davis. Also features Steve Robinson, Santiago Cervantes and Dean McSweeny. Happy Days. http://www.vimeo.com/11233290 David Barnett. Nice to hear from you Dennis. I was very interested in your mini life history. I knew you were a radiographer but great to know you carried on with your musical talents. Organ! That’s a pretty difficult instrument. Glad to know you are still playing the recorder. I do remember you in the recorder group and also remember Jeff Kemp and Hurbert Osgood. I still have a photograph of you at Doris Waymark’s at one of those Christmas concerts at her house. Do you remember the music club she used to run and those G&S opera songs we used to sing? Anyway I’m retired, but still do a bit of private piano teaching. I also run a choir and a barber shop group and play the clarinet in the P.S.A. orchestra(‘Pleasant Sunday Afternoon’) and look after 3 grandchildren on certain days. I do a fair bit of cycling - been to Spain, Italy, France and the Outer Hebrides on cycling holidays. I do remember my time at the Knoll with fondness and especially think of the teachers there – some quite eccentric but always I feel had our interests at heart. All the best, Chris. FAO Christopher Cole: I have recently unearthed some b&w negatives that I have digitised as positives, and among the photographs are some of you and Barry Tutte playing clarinet and piano together. With my contact e-mail address talbot_treetops@hotmail.com – it would be good to hear from you. FAO Christopher Cole: How amazing to find you on this page as I have been thinking back regarding school days at the Knoll School for Boys. We all must be retired now and enjoying well earned state pensions and bus passes. I remember Barry Tutt too and that he lived a few doors down from you in Hallyburton Road Number 19 or 21. I didn’t realise he was fostered out to the people he lived with or that he had died so young. I remember your Mum and Dad, your sister and brother and have a photo of me with your brother’s son. I could send a copy, my contact e-mail address is mrhookham@yahoo.co.uk – it would great to hear from you. For David Barnett: I attended the Knoll School between c.1969/1974. I was fascinated by the latter part of your cine film, the few seconds of the Grenadier and the back of the Knoll School was as I remembered it when I started there. Do you have any other cine clips of the Knoll or Grenadier area from the ’60s or ’70s?. I’d love to see them please and thanks for posting the clip. It’s been very nostalgic to read down through the comments above. I attended the Knoll School from 1961 to 1966. Teachers included, Mr. Harvey Maths. JK Turner, Headteacher. Mr. Smith, Metalwork and Deputy Head. Mr. Waymark, Music. Mr. Martin (I don’t wear a green suit) Tec’ Drawing. Mr Sherbourne, Sports and RI. Mr. Gooders, Science. Mr. Davis (Daddy) English. Mr. Dowell, English and many others mentioned in comments by others above. I will list a few of the lads that I knew in my final year at that school. It’s hard to believe that although I have not seen many of them since we left to go out to work that they will all be sixty-one now like me, but the mental image I have of them is as it was in 1966. They are, Bob Davey, (I kept in touch with him for many years after leaving school) Ashley Stockwell. Steve Rayward. Clifford Moss. Tony Eden. Chris Smith. Douglas Burberry. Nicholas Ozog. Neil Barnes. Jeff Ford and Bob Syzmic both of whom I saw regularly through the 70s thro’ the 90s as we were keen tenpin bowlers. Trevor Downes. Philip Botting. Nicholas Marsh (close friend of Chris Smith). Then those who’s first name I have forgotten, Mssrs:- Williams, Wyatt, Patching, Synowski and many, many more. At the end of every school year just before breaking up for the summer holidays, we sang a very poignant school hymn, that was to say goodbye to those leaving and also for those returning in September one year higher up. I will never forget how it felt to sing that hymn that time when we were all leaving, knowing school days were gone forever. It would be nice if any person reading this and who knows any of the above lads could post to say what they are doing now. Better still, if anybody above reads this, post a message, I hope that everybody is well. Ah!, Mike Tizzard, this is Chris Smith. How well I remember you and all the others you named. Like some others, I came across this page entirely by accident but began to read all the posts; it brought back some memories. Yes, Nick Marsh and I were great buddies and had many adventures together, likewise with Bob Prior and some others. Last I heard of Nick was that he went off to work for Sainbury’s. Bob and I kept in touch for a while, he went into the jewellery business, but we lost contact after a year or so. I went to live in Texas and then Cape Town and a few other places, now I live near Lisbon in a place called Cascais. It would be great to hear from Mike, Bob, Nick and anyone else who wants to relive those days; my email is cys@probus-sigma.eu. The Hymn that Michael Tizzard refers to in his 13/06/2011 posting was number 164 from The Daily Service hymn book used at school. ‘God be with you till we meet again’ – Words by J.E. Rankin (1828 – 1904) to the tune ‘Randolph’ (9 8. 89) by R. Vaughan Williams. On Monday 7 November 2011. You are all very welcome to the next meeting of the Girls and Guys of The Knollites Group to be held at St Richard’s Hall, Egmont Road, Hove (1400 -1600). £2 will get you tea and biscuits and a talk about Magnus Volk. Everbody bring as many of photos the period as you can. See you there. HI Dennis Talbot. After reading through all three web sites for the Knoll School for Boys, I think the need is that it should be amalgalmated into one web site. I met up very recently, through help for one of these web sites, with Chris Cole and his wife Dot. We haven’t changed a bit. He has all lot of various photos of you in Doris Waymark’s classes, including Christmas. I know you have maybe digitised versions of some of these. I know your email address from the Knoll School web site so I would you like to pass on to you some of these if this Ok? The School Photo, which is on the web site, was taken on 30 April 1959, finds you standing behind Basil Waymark. Can you name all the students in our class and the masters? I am left of Barrie Tutte. Even though I wasn’t at school with you all it has been great reading this page, particularly about Barrie Tutte who I knew later. I would like to put something together about Barrie, so would anybody who has any memories, information, photos etc that they are willing to share kindly email them to me at mrrobw2005@yahoo.com. Once I have collected the above I will gladly share it with anybody interested. He was an amazing person and though sadly missed I think he should not be allowed to slip from history. Many thanks. Best wishes. Robert Phil Wheeler. To Richard Elms, yes I remember you, we went on holiday to St Helliers on Jersey, with Andy Barron and Brian Maggs. It was the first holiday I ever took without my parents! We spent most of the first day and a good deal of money on the amazing go cart track by the airport. I lost touch with yourself and Andy but still meet Brian on a semi regular basis as we are both members of the Deep Sea Anglers Club on the esplanade. To others, I started at the Knoll in 1959 and was there for the last year of Mr Dellar’s headmastership! I fondly remember “Dad” Davis who taught English. We heard he was prematurely aged by a traumatic incident, the details of which escape me now. Mr Coop, or Co-op as we knew him, taught history, but I think he was just marking time because I had to leave school before I could develop a life long interest in the subject. Mr Harvey taught maths and I got to know him later when I did some work for him and his wife. He also used to be a charity collector down Station Road, shaking his tin, lovely man. Basil Waymark and music, wiping the LP/78’s on his jacket sleeve before playing something, in the vain hope of stimulating an appreciation for the finer musical offerings. Basil also taught my Mother, like Allen Jempson’s Father so he must have been a grand age! Finally, amongst the remaining masters I recall Jack Liddel, the games teacher and his ‘whacking’ credits! Step out of line and you got the slipper! but, on proffering your credit, he would stick to his word and, albeit grudgingly, let you off the much deserved whacking! (the credits were earned by what Mr Liddel considered were good efforts at the various sporting activities) I also met him out of school later as he drank in the much missed ‘Kings Head” in Shoreham which was my local from 1966-1970. Its great to read of the memories of earlier and later “boys” and hope I have stimulated others! You are all welcome to the next meeting of the Knollites Group to be held on Monday 25th June 2012 (1400 – 1600) at St Richards Hall, Egmont Road, Hove. Come and maybe meet old school friends and exchange memories, photos and even be reminded of things you may have forgotten. £3 entry gets you a cupper, biscuits and a chat from a guest speaker. See you there. Wow, I came across this site by accident and how the memories came flooding back. I was at the school from 61 to 66 and lived in Hallyburton Road. Most of my brothers attended the school as well. Looking at all those names, both teachers and pupils, is amazing. I remember most of them. My fondest memory was being a prefect and getting on the roof to spy on the girls next door. Hope all are well. Hi all. I am new to the site. I lived in Bellingham Crescent in the Knoll Estate in the 1950s. I lived next door to Barry Tutt who lived at 1 Egremont Road. I used to play with him as a child. We used to take his dog ‘Tiny’ out for a walk. This would have been when we were aged between about 5-10. I also had a twin brother Michael although I do not recall him playing with Barry. I remember him as being a lovely natured boy and have often wondered over the years what become of him, and was very sad to read on here of his death. I can remember him moving to Hallyburton Road with his foster parents. His foster dad worked for Brighton and Hove buses. He also had an older foster sister Mary and an older foster brother named nobby. Not sure if that was his real name but that is what everyone knew him by. It would be nice to see some photos of him if anyone has any. The next Knollites Group Social Meeting will be held on Monday 3rd September 2012 (1400 – 1600) at St Richards Community Centre, Egmont Road, Hove. All Ex Knoll School Boys and Girls are welcome as are all old residents. £3 entry gets you tea/coffee, biscuits and, hopefully, a meeting with old friends plus a talk from Trevor Povey on “Old Hove”. You may even see your younger self in one of his “ancient slides”. See you there. Our next Knollites Group Social meeting is on Monday 12th November 2012 (1400 – 1600) at St Richards Community Centre, Egmont Road, Hove. £3 entry gets you a cuppa and biscuits and a talk from our popular guest speaker Ian Gledhill on the ‘History of the Seaside’. Bring your photographs and memories to share and your bucket and spade. No sand please. See you there. Hi I am Steve, I’m a newbie to this site to and to computers. I was at the Knoll School 63-67. Last year, Mr, Harmans class. I remember Dave Strevens (great train set mate), Steve Garrioch, Ronald Pusey, Frank Wren, Jimmy and John Fish, Neil Mcpherson, Steve Miles, and David Enticknapp. If you are out there, please could you get in touch, or if anybody remembers. I lived in Isabel Crescent do you remember? The Knollites Group Christmas Party is to be held on Monday 10th December (1400-1700) at St Richards Community Centre, Egmont Road, Hove. Come along and bring your spouse or partner and relax from christmas shopping. £3 per head gives a first drink, a mince pie and a buffet. Bill Nye is providing the music entertainment. See you there. I am glad some of you fondly remembered my father, Ray Harvey, Maths teacher. Dad died some years ago, but I believe Barry Gooders is well and living in the area. I attended the school and, like many others, have happy memories. It would be nice to hear from anybody who knew me! Our next gathering of the Knollites Social Group is on Monday 25th February 2013 (2.00pm to 4.00pm) at St Richards Community Centre, Egmont Road, Hove. It is also our AGM so we are expecting quite a crowd. £3 entry also provides you with tea/coffee plus biscuits and a talk from Bob Cairns on local history. See you there. Our next gathering of the Knollites Social Group is on Monday 25th March 2013 (2.00pm to 4.00pm) at St Richards Community Centre, Egmont Road, Hove BN3 7FP. It is still only £3 entry and provides the usual refreshments. Our guest speaker is Chris Dimmer a Crime Prevention Officer who will be accompanied by two Community Police Support Officers. See you there. The next Knollites Group social meeting is on Monday 20th May 2013 at St Richards Community Centre, Egmont Road, Hove BN3 7FP from 2.00pm to 4.00pm. Entry is still £3 and provides you with refreshment. Our guest speaker is Clive Hamblin who will talk through “100 Years an Hour” from 1900 to 2000 using newspaper items, poems and songs. The next Knollites Group social meeting is on Monday 29th July 2013 at St Richards Community Centre, Egmont Road, Hove BN3 7FP from 2.00pm to 4.00pm. Entry is £3 and provides you with refreshments. Our guest speaker is the very popular Ian Gledhill who will talk about “Art and Illusion”, the story of stage scenery from Sophocles to Spiderman. See you there. Our next Knollites Group (formally “Old Knollians) social meeting is on Monday 23rd September 2013 at St Richards Community Centre, Egmont Road, Hove BN3 7FP from 2.00pm to 4.00pm. Entry is £3 and provides you with refreshment. Our guest speaker is Peter Hill, a retired proprietor Community Pharmacist, who will give a light hearted account of his life called “Pills, Potions and Patience” which includes a display of pharmaceutical memorabilia. See you there. The next Knollites Group social meeting is on Monday 25th November 2013. Same place, same time and same price. (See above) Our Guest Speaker is Ian Gledhill who will talk about the seasonal subject of “The Magic of Pantomime”. See you there. Details of the Reunion and Christmas Party, on Monday 9th December 2013, will follow later. The Knoll Boys and Girls School Reunion and Christmas Party is on Monday 9th December 2013 at St Richards Community Centre, Egmont Road, Hove BN3 7FP from 2.00pm to 5.00pm. Wives, husbands or partners are most welcome too. At £3.00 per person this includes a glass of wine and a mince pie on arrival and a Buffet with either tea or coffee. We have semi-professional singers to entertain us including a medley of songs from famous shows, carols of course and John Beever to round it all off. See you there. Monday February 24th 2014 is a date for your diary as we are not only having our Knollites Group Social Meeting but also our 5th AGM. You are most welcome. The time is from 2.00pm to 4.00pm, the same place and still the same price (see above for details of the venue and the price). Bob Cairns is our speaker on Local History. See you there. Our next Knollites Group Social Meeting is on Monday 24th March. Come along and meet us at St Richards Community Centre, Egmont Road, Hove BN3 7FP from 2.00pm to 4.00pm. Bring photos, lots of memorabilia including any copies of The Weathervane magazines you may have, plus £3.50, and this will also not only provide you with refreshments but a talk from our Guest Speaker, Ian Gledhill, about the History of Brighton Trams. See you there. Have you any copies of The Weathervane magazines? Paul Hammond has loaned me issues 1 and 3 which make fascinating reading. Have you a copy of issue 2 and were there further issues? We hope to copy these to a Knoll School for Boys Achive that we hope to set up very soon. Thanks. See you at the next Knollites Group Social Meeting on Monday 19th May. Same time, same place and the same price of £3.50 (for more details - see above). Our guest speaker is Mike Barker from the Air Ambulance Service and hear about their life-saving work. Paul Harvey. Your Dad once bawled me out during a maths lesson. I think the decibel level was off the scale. During the lunch period I returned to the classroom (5G) and seeing a group of lads crowding around a desk at the back of the room I decided to make a comic entrance, duplicating quite a realistic copy of your Dad’s exclamation an hour or so earlier, “Robinson”. The group turned and parted with faces reflecting the horror of what I had done revealing your wonderful Dad sitting at the desk explaining some Maths to the interested lads. I still remember his smile as I wilted before them all. He was an excellent teacher and a great bloke generally. I went on to become a teacher and always kept my sense of humour, especially with the class clowns. Our next Knollites Group Social Meeting is on Monday 28th July. Come along to St Richards Community Centre from 2.00pm to 4.00pm and meet up with old friends and make new ones. £3.50 entry also provides you with refreshments and Peter Hill is our Guest Speaker who will enlighten us about our Sussex Windmills. See you there. See you at the next Knollites Group Social Meeting on Monday 22nd September. Meet with up to thirty ex- Knoll School Boys and Girls to exchange memories and photos. Same time, same place and the same price of £3.50 (for more details – see above). Our Guest Speaker is Ian Gledhill and the subject is “Halfway to the Stars”. Our next get together of the Knollites Group is on Monday November 24th at St Richards Community Centre, Egmont Road, Hove BN3 7FP from 2pm until 4pm. £3.50 entry provides you with refreshments and a talk from our Guest Speaker Fran Evans about Trading Standards and she will follow this up with a QUIZ. I HOPE THE BOYS WIN THIS TIME. See you there. The Old Knoll Boys and Girls School Christmas Party and Reunion is on Monday 8th December 2014 at St Richards Community Centre, Egmont Road, Hove BN3 7FP from 2pm until 6pm. Wives, Husbands and Partners are most welcome too. £5 entry per person provides you with a glass of wine, food and entertainment will be provided by semi-professional singers with John Beever to rounds thing off. See you there. Our next Knollites Group Social Meeting and 6th AGM is on Monday 23rd February at St Richards Community Centre, Egmont Road, Hove BN3 7FP from 2pm to 4pm. £3.50 entry also provides refreshments. The meeting will be followed with a talk on “Local History” by Bob Cairns. See you there. See you at our next Knollites Group Social Meeting on Monday 23rd March. Same place, same time and still the same price of £3.50 (for more details – see my entries above). Our Guest Speaker is Christine Simpson from AGE UK followed by my quiz. Our Guest Speaker, at the next Knollites Group Social Meeting on Monday 18th May, is David Porter who will talk about his life above a Railway Tunnel (Clayton). See you at St Richards Community Centre, Egmont Road, Hove BN3 7FP from 2pm to 4pm. £3.50 entry also provides refreshments. Our first social meeting as Old Knollonians (ex-The Knollites Group) is on Monday 27th July at St Richards Community Centre, Egmont Road, Hove BN3 7FP, from 2pm until 4pm. £3.50 is still the entry fee. Our guest speaker is Ian Gledhill who will explore the age of Edwardian musical comedy. See you there. George Harman, once teacher at the Knoll, passed away on 15th July 2015 aged 88. He often spoke of his years at the Knoll with great affection. So sorry to hear that George Harman has passed away. My condolences to you and your family. Please could you let me know the years that he was at the Knoll, the subjects that he taught and where he moved on to. Kind regards. See you at our next Old Knollonians Social Meeting on Monday 21st September, same place, time and price (see above). Our Guest Speaker is Peter Hill who will take us from “Peggy’s Cove to Niagara Falls”. Don’t get wet. The next Old Knollonians Social Meeting is on Monday 23rd November, same place, time and price. Our Guest Speaker is Alexandra Loske who will tell us about George IV and his Giraffe. See you there. Old Knollonians invite all Knoll School for Boys and Girls and their wives, husbands or partners to our Christmas Party and Reunion to be held on Monday December 7th at St Richard’s Community Centre, Egmont Road, Hove BN3 7FP from 2pm until 6pm. £5 entry per person will provide you with food, a glass of wine or a soft drink and entertainment. Come along and meet old friends or make new ones. See you there. See you at our next Old Knollonians Social Meeting to be held on Monday February 8th at St Richard’s Community Centre, Egmont Road, Hove BN3 7FP from 2pm until 4pm. £3.50 entry provides refreshments and a talk from our Guest Speaker Bob Cairns who asks “Did you know your Grandparents?”. Our next Old Knollonians Social Meeting and AGM is on Monday 14th March at St Richard’s Community Centre, Egmont Road, Hove BN3 7FP from 2pm until 4pm. £3.50 entry also provides refreshments. The meeting will be followed with a talk from a member of the East Sussex Fire and Rescue Service. See you there. We look forward to seeing you at our next Old Knollonians Social Meeting on Monday 23rd May. Same place, time and price (See previous entries). At our last Social Meeting our Committee of now ten welcomed three new members. Very popular Ian Gledhill is returning to tell us “The Gilbert and Sullivan Story”. Come along and hope to see you there. See you at our next Old Knollonians Social Meeting on Monday 14th November at St Richard’s Community Centre, Egmont Road, Hove BN3 7FP. Same time and price. Alison Edwards is our Guest Speaker to talk about “Money Matters” which is just in time before our big Christmas “spending spree”. Hope to see you there. Our next Old Knollonians Social Meeting and AGM is on Monday 13th February. Still the same place, time and price of £3.50 (see the entries above). Bob Cairns is returning to talk to us about Family History Stories. We welcome all new boys and girls from the Knoll School era. I would like to welcome you to our next Old Knollonians Social Meeting to be held this Monday 27th March. Same time and place but the price has changed, but only by 50p, to £4.00. Share your memories with a cuppa and a cake, and afterwards Chris Horlock will talk us through the “Lost Theatres of Brighton”. Hope to see you there. Another Old Knollonians Social Meeting is lined up for Monday 22nd May. Still the same place, time and price as our last meeting. Ian Gledhill is returning to talk to us about “Golden Vienna”. Hope to see you. Come along to our next Old Knollonians Social Meeting to be held this coming Monday 24th July and it is still at the same place, time and price. Our Guest Speaker is Paul Green who is returning but this time to talk to us about “Sussex Murders”. I hope it is not mine. Come along to our next Old Knollonians Social Meeting on Monday 24th July at St Richard’s Community Centre, Egmont Road, Hove BN3 7FP from 2.00pm until 4.00pm. £4 entry provides refreshments and a talk from our Guest Speaker Paul Green about “Sussex Murders”. See you there. The next Old Knollonians Social Meeting, which is also our AGM, is to be held on Monday 12th February at St. Richard’s Community Centre, Egmont Road, Hove BN3 7FP from 2pm until 4pm. £4 entry includes refreshments and Bob Cairns is returning as our guest speaker with more of his family history stories. See you there. Our next Old Knollonians Social Meeting is on Monday 23rd July 2018 at St Richard’s Community Centre, Egmont Road, Hove BN3 7FP from 2pm until 4pm. £4 entry includes refreshments and Chris Horlock returns as our Guest Speaker to talk about “Brighton in the 1950’s”. See you there. Come along to our next Old Knollonians Social Meeting this coming Monday 10th September 2018 at St. Richard’s Community Centre, Egmont Road, Hove BN3 7FP from 2pm until 4pm. £4 entry includes refreshments and Phil Green, our Guest Speaker, returns to follow up on his talk last year about “The Argus”.